The Annual Celebration, of the life and works of Robert Burns, the main event in the Club calendar, is held on the Friday nearest the anniversary of the Bard's birth (January 25th). 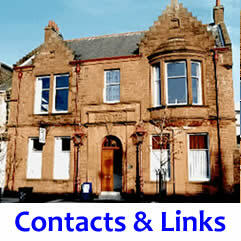 We attract about 180 members and friends. Honorary members are elected by acclaim at this event. 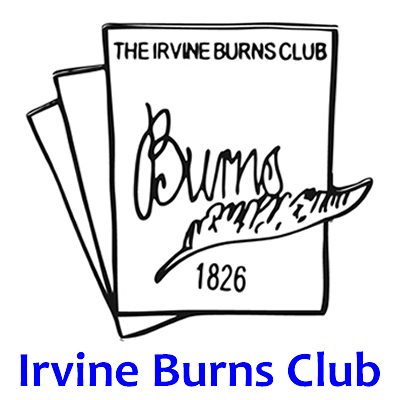 The Annual Celebration of Irvine Burns Club has not one top table, but two, one down each side of the hall. For a photo of top table guests before they are piped into the hall, see below. The Irvine Celebration differs from those of many other Clubs in (at least) two ways. The Immortal Memory is always proposed by the President of the year, so that the Club members can enjoy a fellow-member's contribution to an appreciation of Robert Burns. 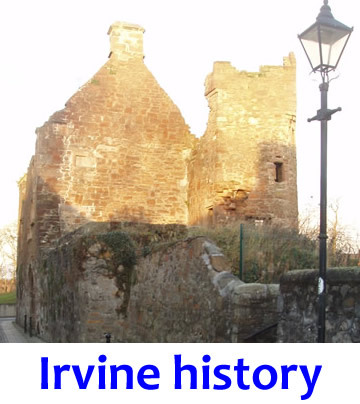 Secondly, the evening contains a Toast to Bonnie Jean - a gallant Irvine demonstration of the importance to the Bard of having a supporting and faithful wife - listen to Fr W Boyd, as Vice-President, delivering this Toast in 2004 - audio file. Musicians of note play at the top of the hall, and fraternal greetings from other Clubs are displayed on a stand at the foot of the hall. 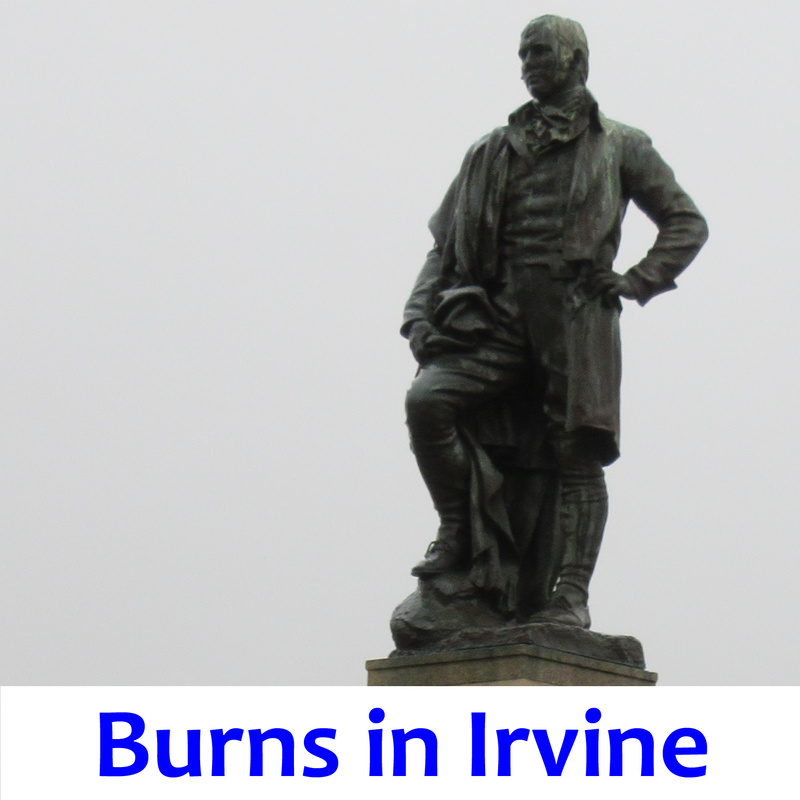 On the Sunday of that weekend, Burns weekend is remembered in the Parish Church in the morning, and in the afternoon wreaths are laid at the statue of Burns on Irvine Moor. The President for the following year takes office at the end of that afternoon. 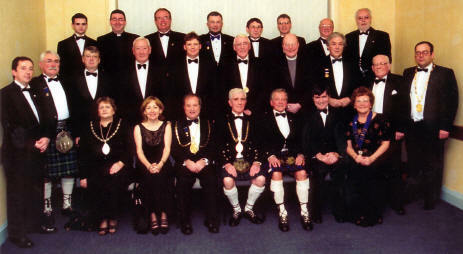 Front row: Andy Howat (Vice-President Elect), Eric Park; seated: Fiona Barr (Irvine Business Club), Irene Oldfather (MSP), Jim Burns (Deacon Convener, Irvine Incorporated Trades), Hugh Drennan (President), Eric Caldow (new Honorary Member), Brian Donohoe (MP), Margaret Cook (President, Irvine Lasses Burns Club); standing: Jack Carson (Councillor) and Sandy Muir (Past Captain, Irvine Carters Society). Middle row, from 4th along: Willie McPike (Vice-President), Rev. Robert Travers, Donald Watson (Vice-President, Rotary Club of Irvine Seagate). In the back row, you may spot Fr Willie Boyd (2nd along), Hugh Hutchison (4th), then David O'Neill (Councillor) and Duncan Rennie. 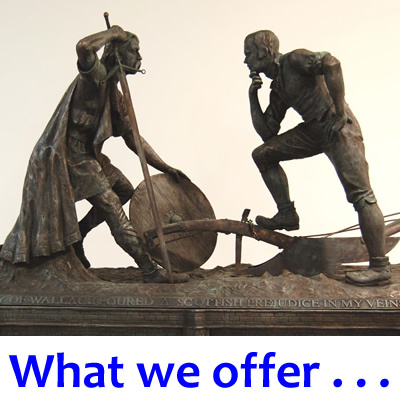 For our latest Honorary Members, see the Honorary Members page in the 'Objects & Projects' section. The 2008 Honorary members were James Wilson, OBE, and Phil Cunningham, MBE, composer and musician. There were 188 at the Annual Dinner that year. The Jan. 2007 Honorary members were Bill Cowan (one of our stalwart Past Presidents), Michael Marra the singer, and George Macdonald Fraser (of Flashman fame). Since then, Rt Hon Gordon Brown and Rt Hon Alex Salmond have both confirmed acceptance of Honorary Membership. The Annual Celebration was again excellent. The 2006 Honorary Member was Ian Rankin, author of the best-selling Rebus novels. Tom Strachan of Springside presented the Club with a framed family tree of Robert Burns and Jean Armour, along with a lectern and an edition of the poems, in September 2003. Albanian poet, Dhori Qiriazi, presented us in June 2003 with a volume of his translations of many of the Bard's works into Albanian. Born in 1933, he passed away in 2009.